One of the inevitable rites of passage for graduate school in the humanities comes in that fateful seminar grappling with the intellectual legacy of what is vaguely termed Social Theory. That is exactly what I’m up to this quarter at UCLA, in a seminar aptly titled “Integrating Theory With Ethnography,” taught by the esteemed music scholar Timothy D. Taylor. In this class, we read a whole bunch of this Social Theory stuff and then figure out on our own how to integrate it into our own ethnographic work with music. After having spent the last year or so “in the trenches” of the jazz business, this Social Theory is having all sorts of interesting and strange resonances with my experiences there. 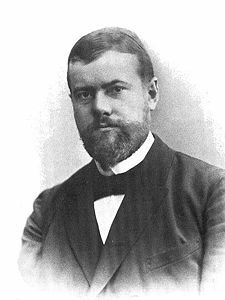 This week, it struck me especially hard as I read Max Weber’s famous book, The Protestant Ethic and the Spirit of Capitalism. As I see it, Weber’s insights have particular relevance for the current challenges facing the jazz community. Weber’s central conclusion in The Protestant Ethic is that modern capitalism as it existed in the 20th century could not have existed without a series of significant moral shifts alongside it, namely the belief in the virtue of hard work for its own sake, frugality, and constant productivity beyond the simple need for human subsistence. He finds evidence of this form of morality in the writings of Benjamin Franklin: “Time is money,” “After industry and frugality, nothing contributes more to the raising of a young man in the world than punctuality and justice in all his dealings,” and other familiar admonishments. This attitude, I believe, still pervades contemporary artistic life in the United States — certainly in the jazz community, where a generation of extremely thoughtful, hard-working and necessarily frugal musicians have dedicated themselves to the inspired calling of making jazz music. But the difference that I have noticed — indeed, that I experienced as a struggling musician in Oakland after college — is that more and more, this ethic of hard work, frugality and dedication to a noble calling is no longer supported by the economic structure of contemporary capitalist society. Worse, as Ian David Moss has consistently pointed out, opportunities for a professional life in the arts are being restricted to those with outside economic means to support their artistic goals. This is a big deal, leading to an extremely difficult cognitive dissonance within the community; the idea that hard work, humility, diligence, and talent are no longer enough to earn a decent living flies in the face of the fundamental assumptions of the Protestant Ethic. Members of the community have adjusted to this fact in different ways. Many have chosen to organize themselves into communities outside of the capitalist system, banding together into economically marginal yet self-sufficient units such as the New York loft scene. These communities have, in a sense, abandoned their faith in the Protestant Ethic in favor of a more pragmatic traditionalism, endeavoring to nourish the members of their community outside of the crumbling capitalist structures that have supported it in the past. Others, such as Adam Schatz of Search and Restore (left), have doubled down on the heroic ideal of hard work and frugal fanaticism, applying the same acquisitive impulses to the cause of their calling: building a new audience for jazz. Schatz’s evangelical zeal has not gone unnoticed by journalists: “Search and Restore Spreads New Jazz Gospel to DC,” writes Capitolbop; “How Adam Schatz Just Might Save Jazz,” writes Ben Lear. Something tells me that this is the sort of thing my man Weber might have dug. It’s not too late to support the project! This entry was posted in Education, Ethnomusicology, Jazz Books. Bookmark the permalink. You are a skilled writer. It’s really interesting to read your viewpoint on how jazz and protestant values effect each other. I never really thought about that till now. Thanks for sharing your writing. Look forward to reading more.